When Victor Fatoohi and Ethan Guthrie, 10th grade learners at SCVi’s Innovation Studios, found themselves in need of internships during the 2017/18 school year, they came up with a solution: They started a business instead. Guthrie was originally working on developing a streaming music website, but as the two started to work together, they asked themselves what would be a better option for a workable site that wouldn’t require costly music licensing. What they discovered is that there is legal provision for nonprofit organizations to freely rebroadcast certain television content. In developing the site, the two realized that much is still left to be desired for those who “cut the cord” and get rid of cable TV, particularly when it comes to channels such as basic networks, The Weather Channel, C-SPAN, and others. The site designed, launched, and managed by the duo provides a legal online streaming platform. Guthrie explained that to legally rebroadcast content as a nonprofit, Onaii Corp. needed to be incorporated as a business (Wyoming, it turned out, was the lowest-cost option). Guthrie said the legal aspects were among some of the most challenging parts of creating Onaii. Innovation Studios Coordinator Malaka Donovan said she was very impressed during the meetings Guthrie and Fatoohi had throughout the process, noting how well they had researched their plans, and the detailed legal questions they were asking lawyers regarding the business incorporation. 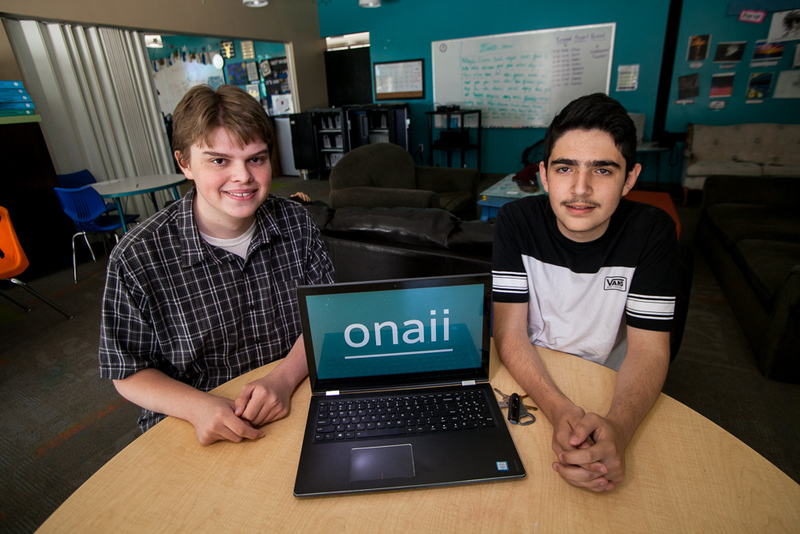 Guthrie and Fatoohi said developing Onaii has drawn on a number of skill sets in which they have interest, particularly designing, building, coding, scaling, and hosting a website. The site is mobile-friendly, and Guthrie said they have built a Roku app, and are working on an Apple iOS app. While the site is technically live, the two said they are continuing to make tweaks and adjustment before officially rolling it out and promoting it. As far as the future, Fatoohi and Guthrie, who have been at SCVi since eighth grade and seventh grade, respectively, have their sights set on likely continuing to pursue careers in the tech field, or even law, in Guthrie’s case. A project like Onaii is just one example of the forward-thinking educational approach of iLEAD’s Innovation Studios, which gives learners the freedom to play to and build on their strengths, challenging themselves while laying the groundwork for a promising future.